From the second I saw the synopsis of the book I wanted it :The main character saw people in the photos of the wood and I was like:As we all knew who they would be! But then she woke up tied to a chair and I was like:But they were really nice:Regulus was smoking and I was like:and all the moments between him and Mia I was like:But then Austin was in the way and I was like:And it was going on about portals and I was like :And they were hunting down a killer:and it was over too soon: And overall the book was :So yeah I will be getting the next book.... What the book is about!A missing boy, government agents, an interdimensional portal... Mia has one goal for her senior year at Whispering Woods High-find her missing older brother. But when her science project reveals a portal into another dimension, she learns that travellers are moving in and out of her woods in the most alarming way and government agents Regulus and Arizona are policing their immigration. Mia's drawn to the mysterious, aloof Regulus, but it's no time for a crush. She needs to find out what they know about her brother, while the agents fight to save the world from viral contamination. But when Regulus reveals that he knows Mia's secrets, she begins to wonder if there's more going on than she thought...and if she was wrong to trust him...Favourite character: Regulus <3Best line: .....Erm... none that stood out but there were some funny ones and cute ones!Best part( beginning, middle or end): Middle.....maybe end.... make that the end! !Character who needs to die. Like now. : None of them really.... maybe the killer ( but its a spoiler)Reaction to end: Hell yeah! Regulus....marry me?Summing up the book in three words: Fresh( not like other YA), Quick-read , GREAT!! This and other reviews can be found on The Psychotic NerdMY THOUGHTSWhen I'm about to start a book, I prefer to not read the synopsis. Do I read the synopsis when I add it to my TBR list, a little, yes, but by the time I read the book I have forgotten what the synopsis said. I do this to be surprised and I was definitely surprised by this book! I don't know what I was expecting, but I had no clue that parallel universes were involved! For those of you who don't know, I have a bit of an obsession with parallel universes! I absolutely adore books with this aspect!This book follows Mia, who lives in out in the woods in the small town of Whispering Woods. She has been using a motion activated camera to capture animal photograph for a school project, but she ends up finding a pair of men in a few photos. Ones that she doesn't recognize as being part of her small town. When she meets this men in person and gets kidnapped in her own home, she finds out that the men are government agents, guarding a interdemensional portal in her own yard. Turns out that they may know something about her brother, who disappeared a year ago.The characters in this book are so well-developed and great. Mia is a very strong, independent main character. Arizona and Regulus, the agents, are very interesting. Arizona is more fun and out-going, while Regulus is more serious. Mia's friends are amazing! I loved how Mia was able to tell her friends everything that was going on and how they believed her. Most YA books exclude friends from the main character paranormal life, which I always disapprove of.The main plot of this book is probably my favorite thing about this book. I already flailed over my parallel universe obsession, but I really liked how well the portals were explained. And the whole idea behind the book is very unique. We don't really get to see other worlds, which is a shame, but it is still a very interesting idea. IN CONCLUSIONOverall, an amazing read! It has great characters and a very unique story line! This is a fairly short book, but I had a very hard time putting this book down. I do recommend it and I actually have the next book ready for me to read on my ereader! Rating: 4.5/5The Waiting Booth is the first book in the Whispering Woods series. This book follows Mia, a girl whose brother has gone missing and is trying to pick up the pieces ever since, living with her dad in Whispering Woods. One day Mia meets two handsome college guys, Regulus and Arizona, who turn out to be government agents who monitor the traveling through a portal into another dimension. They want to recruit Mia, since just like her brother, she also has the power of synesthesia. This book was really good. It has a very unique storyline, I don't think I've ever read anything with a story quite like this one. The whole idea seemed brilliant to me and I really enjoyed the execution. The story was really fast paced. It's a small book but still a lot of things happen and none of them are boring. The plot kept on unraveling, getting me more and more hooked by the page.My favorite thing of this story though, were the characters. I loved them all. Berry has a way with making her characters so interesting and unique. They really stood out and were brought to life throughout the whole book. I loved Mia and her friends, Austin and Em, also loved (way too much) Regulus and Arizona, those guys are simply brilliant.I am really looking forward to reading the rest of the series. I started reading this book and found I couldn’t put it down. Brinda has a nice, steady pace to her writing that keeps the pages turning and the excitement mounting. The suspense was well done. Throughout the book I knew there was someone I couldn’t trust, but I didn’t know who till the very end, which left me nicely surprised. Book One introduces Mia, an independent girl who already has enough drama in her life, yet she attracts more when she accidentally discovers an interdimensional portal. Her brother is missing and travellers from this portal lure her into helping them find the bad guys by promising to help her find her missing brother. Along the way Mia is thrust head first into more than one dangerous situation. I found myself rooting for her to come out of these experiences unscathed because she is an easy to like character and I became slightly protective of her. There is more to come on “The Waiting Booth” story and I look forward to reading about Mia’s attempt to track down her brother when Brinda’s second book in the series is released. Mia is a teen very close to being an adult but has had to learn to live without her mother since she was five and her mom ran off, leaving her and her brother alone with their dad. A year ago her brother Pete went missing and all she could think about was finding him. Mia and her friends Emily and Austin were a bit of the misfits that just did not want to fit in. When two guys show up out of nowhere all of their lives are going to be turned upside down and it’s up to Emily to figure out which way to go but will it get her friends hurt or will she become just as lost as her brother? Good read. “My new life began on Saturday.”That’s the first line in Brinda Berry’s THE WAITING BOOTH, and from that hook you’re in it, line and sinker. The story opens over pancakes and a missing brother, but things turn creeptastic from there. A long gravel drive, sketchy happenings in the woods, and a single father away for days on end leaves Mia Taylor’s young life teetering a bit to the left of cozy. Then a relatively benign science project pushes things into another dimension … or rather pushes the other dimension to her neck of the woods—quite literally so in the form of a couple of “enforcers” with a dubious talent for first impressions.There’s much to love about this story. Mia’s voice is strong, yet the reader senses her vulnerability. One part that really sticks with me is how she wonders what it must be like to be her friend, Em, who has two parents, a sibling who hasn’t gone missing, and a home cooked dinner every night at six. The moment is poignant, the contrast gut-wrenching as Mia sits alone, peeling plastic off a frozen microwave dinner. Elsewhere, when her car makes contact with one of the less couth travelers from another dimension, she realizes the shrieking she hears is herself—the same kind of scream she used when her brother had “accidentally, or on purpose—when you have a brother, it’s hard to tell—shot a bottle rocket in the back of [her] shoe.” Wow. In the space of a single sentence, the reader feels a connection not only to Mia, but to her brother Pete—the latter all the more impressive considering he’s not a character the reader meets firsthand.But Mia isn’t the only one with a strong voice. Regulus—one of the IIA agents caught on film by her science project—is the silent type, but his cohort Arizona is a laugh a minute. At one point, tiring of Arizona’s chatter, Regulus laments to himself that Arizona talks more than anyone he had ever known. These details are small in the big picture, but are the very thing that allows the reader to relate to these characters on such an intimate level.That example is the rule rather than the exception. Throughout THE WAITING BOOTH, the characters are brilliantly written. Even the minor players are brimming with personality, from the ponytail tugging, Risky Business watching father (yeah, that made me feel old) to the elderly neighbor who clutches her “little old lady bag” and uses the phrase “tar hill.” Moreover, she won’t call Mia’s cell phone because she herself doesn’t own “a cellular phone,” therefore she’s certain it would never work. Mia finds this hilarious, and I’ve got to say I’m on board with that assessment.The plot is well crafted, the fantasy elements tied in with bits of reality to the point that I fell for the whole thing. I became so immersed in the story that it didn’t occur to me to question the existence of a portal—or of agents monitoring the immigration of traffic therein. When a couple of dark characters slipped past Arizona and Regulus, my heart resided most uncomfortably in my throat. To that end, there were a few uncomfortable moments—in particular with the so-called unauthorized travelers—and the story was better for it. When, as a reader, your skin crawls and your heart claws at your chest, you know you’ve been snagged.That’s the dark side. On the lighter end of the scale, Mia has her hands full with her longtime friend Austin, who is taking steps over the line of friendship. Dodging his kiss was one thing, but when Austin catches Regulus and Arizona sharing a pizza in Mia’s kitchen, the tension mounts. I found it hard not to like Austin (I’m such a romance junkie), but I found Arizona to be charming and pulled for him throughout most of the story. In the end, however, it was Regulus with whom Mia shared a deeper connection—tangible moments which first fill the reader with the sweet, shaky tendrils of new attraction, then linger warmly as a question of what might come.THE WAITING BOOTH is the first title in the Whispering Woods series, and I have to admit I’m eagerly awaiting Book Two. Ms. Berry’s clean, engaging writing style and talent for creating characters who burst from the page are just as addicting as the deepening mystery surrounding the disappearance of Mia’s brother, Pete. While that particular plot point isn’t entirely resolved, the ending leaves the reader, like Mia, just a little bit fluttery about what’s to come.When an author and her characters put forth such a powerful connection, it comes at no surprise when, at the story’s conclusion, you find yourself excitedly perched on the little red wooden bench of THE WAITING BOOTH, eager for more. This was really interesting. I could have done without Austen being all weird and clingy. I am looking forward to the rest of the series. This book is free on kindle right now! Warning, there are some spoilers ahead.The Waiting Booth by Brinda Berry is an excellent book. The majority of the time, the book remains in first-person perspective looking out at the world through Mia. She is in a difficult spot because her brother Pete has been missing. However, soon she meets two mysterious and extremely hot guys that offer to help her uncover the whereabouts of her brother. Despite a rough start, she eventually learns to trust them. But there is enough tension in the book that you never really know until close to the end if Regulus and Arizona have Mia's best interest in mind.I thought the men in the book were particularly engaging. Brinda knows how to write them with just enough flavor to allow them to leap off of the page. She also takes chances with her writing by switching occasionally to third-person perspective. It isn't particularly "jarring" as one might expect because she treats these shifts in point-of-view as their own separate chapters. I might have gone about it differently. However, it does seem to work okay particularly as a vehicle to impart information to the reader that they may need to know.Brinda also has a thoroughly engaging story. She has an amazingly detailed world and has done a lot of impressive world-building to allow the reader to feel its authenticity. I think that this book would appeal to readers of Shatter Me by Tahereh Mafi or perhaps those who love strong female characters with paranormal powers (and mysterious men). All I can say is, I hope Brinda is working on a sequel. The Waiting Booth was a fantastic and quick read. Brinda Berry has a strong young adult voice and blends normal teen angst with ‘out of this world’ problems. Take brother-like friendships morphing into unwanted crushes, balancing homework and friends, and then add inter-dimensional portals, a missing brother, and hot strange guys to the mix for an engrossing page turner. I look forward to the next installment of this series and more work from Brinda Berry. I was pleasantly surprised how good The Waiting Booth turned out to be. It was a good, quick read and I came to care about the characters. I read a lot, and this is better than many things out there. It's not Dickens, don't get me wrong, but it's a fun YA read. I've already purchased Book 2 in the series. For the first novel in a teen series, this was very good! It captured my interest from the beginning, and it kept me wondering the entire time. I was able to be one step ahead of Mia the entire way, but that was probably because of my own reading level. I strongly recommend this novel to those who are interested in reading urban fantasy. I really enjoyed the the fact that I could completely emerge myself in the story and before i knew it the whole day had gone by. Great read starting #2!! GENRE: YA FantasyTHEME: Futuristic/RomanceRECEIVED: Received for ReviewBLOG: http://seeingnight.blogspot.com/REVIEW:I was really excited to get into the Whispering Woods series by Brinda Berry for her tour this week. The Waiting Booth was an instant thrill; I really enjoyed the characters and mystery of what is happening in the wood in this small town.The Waiting Booth follows Mia, a teenage girl who hopes to find her missing brother. Then one night after viewing some videotapes for her school project, she notices two mysterious men appearing and disappearing in the woods by her home. Mia gets pulled into their world, with an interdimensional government, travellers from other dimensions and how it all may be connected to her brother’s disappearance. Mia is an independent girl who was born with a condition called synesthesia. She can see colors through words and sounds that change her perception of everything around her. Her brother has the same condition, which brings Arizona and Regulus into the picture. They need her help and could also be able to help her find her brother. Mia has a strong determination to find Peter, but also is intrigue by the discovery that there are different dimensions of earth. Regulus and Arizona, the IIA agents who are trying to recruit Mia, are what really spice up this story. Arizona is a mischievous and easygoing guy who pretty much keeps his partner on the calmer side. Regulus is a little rough around the edges and doesn’t know how to interact well with the humans of this dimension. Together they make an entertaining duo. I really enjoyed the plot and how they IIA’s job was to make sure other humans from the different dimension stayed in their worlds. It was a lot to take in but so entertaining and clever. I wished the villain was a bit more interesting; he/she fell a little short for me. But I know that it picks up more in the second installment.Overall my favorite aspects were of Mia and her friends dealing with the two IIA agents. Also really enjoyed the chemistry between Mia and Regulus and jealously from her friend Austin. 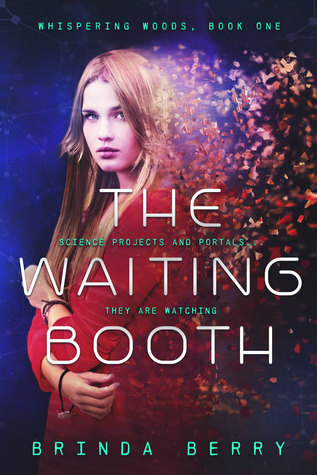 Brinda Berry creates an exciting new series and memorable characters; I highly recommend The Waiting Booth.RECOMMENDATION:This is a young adult novel with a unique science fiction story line. Fans of The Host by Stephanie Meyers and Lauren DeStefano’s The Chemical Garden will want to get there hands on Brinda Berry’s Whisper of Memory. Firstly, i want to start on how great the book cover is. While it's not something special i really love it. Maybe because it looks so great, and it has been made for a self published author. I wish the book existed printed to buy it.This is a book that no matter then negative things you find around you like it. The story is so compelling and interesting, with mystery, fun and action that made not just go through the whole book but to love it too. I liked how the romance was in balance with the more serious part of the book, and the real plotline behind. It had its moments, which i loved each one of them no matter how predictable they were and it felt so real. It made sense to me. The author didn't force nothing in the story, but everything takes place in its right time. And even though the book is small, it fills you like you've read one of the big 400 pages stories.Now i said, there are negative things. I need to rephrase that into, things that didn't match with my style because they are not bad. I just don't prefer them.The thing that confused me more were the descriptions of the characters or better the lack of it. I prefer to have a good solid image on how the characters look from the first chapter we see them, so i can have a good image in my mind. Here you get them, at about 40 pages, some later.And next we have the characters. While i really liked all of them (especially Austin and Arizona..falling for those two! ), there were times i wanted to punch Mia. One i remember really was, we were getting some answers to the questions and she was sarcastic all the time. I was like "please shut up and let them talk". The fact, that she sees her mistake though made me respect her. And second thing about Mia, how she always wanted to seem so strong and that she could handle everything and didn't want help. I could understand her at times but others seemed so childish.Still as i said, i loved the book. It was fast and kept me at the edge of my seat all the time. And maybe the not perfect main character, made it even better. I just know, that it's a book i can re-read and enjoy it from the start again. I give this a between 4 and 4.5 rating. I received a copy for review through the group Knights of the Round Table on Goodreads. I thank the author and the group for the same. This is a debut novel by the author Brinda Berry in the young adult – fantasy category. The protoganist Mia has a neurological condition, synaesthesia where the mixing of the senses enables her to see colors within sounds, smells, and words. The story begin in a calm, everyday manner with high schooler Mia’s interaction with a busy but protective father, musings over her missing elder brother Pete and her science project in the woods adjoining their rather secluded home. Austin and Em are Mia's best friends, though Austin would like to trade the friend tag for something more, something Mia can’t see him as.It is the chance photographing of seemingly shady characters Regulus and Arizona that hurtles her into a far secretive, deceptive and at times dangerous world beyond the ordinary. She is literally pushed into the other dimension in her part of the woods with Regulus and Arizona turning out to be “enforcers” with an inter-dimensional monitoring agency IIA.Their apparent knowledge of her brother and their story makes them trustworthy but a series of incidents and interactions with her project mentor threatens to change everything to a point where she doesn't know whom to trust.The primary characters, romantic partners Mia and Regulus are strong and vulnerable in their own way.The secondary ones whom we may see more of in the later books like Arizona and Austin shine through with humour and risk taking loyalty respectively.The concept of portals which I expected to reveal an alien world but unveils a totally different one was a great move by the author. The act of betrayal at the end is again unexpected though the way the scenes are incorporated left me with an unsettled feeling as a reader. Maybe, the next book will expand on it and make it clearer.Overall I enjoyed the book and would recommend it to lovers of YA fantasy that is not based on magic.The review will be posted in my blog and at Amazon in a few days. This is another one of those e-books that I received to review a while ago. I'm sorry it has taken so long. This book is about a young girl - a high school student - whose Mother left the family and whose brother has disappeared. She lives with her father in Whispering Woods. She is working on a science project collecting data on the affect of the phases of the moon on nocturnal feeding patterns of wildlife. She does this by setting up cameras in certain wooded areas around her home. One night she gets a surprise slide of two men who seem to just appear on the film. It turns out these two are agents from a different dimension and the portal they use to get to Earth is beside her Waiting Booth (where she used to wait for the bus). The men are supposed to be working with Pete, her brother, to keep the Earth safe from beings that want to infiltrate and spread disease. The girl, Mia, and her brother Pete have a gift for seeing emotions and vibrations around people and things in different colors. Since Pete is gone, the inter-dimensional organization wants Mia to take his place. Mia reluctantly gets involved because she thinks the two agents can help her find Pete. The book moves along quickly and Mia, her friends, and the two agents have some interesting adventures. Of course, it wouldn't be a young adult book If it didn't involve some kind of romance between two of the characters, but I'm not telling which ones. I liked this book. It moved along and I found myself wanting to keep reading to find out what happens. The end could have been the end, but I believe there is a sequel and I believe it is on my Nook at this very moment. I'll get back to you when I finish it. A good read. I LOVED the world, the story, the awesomeness of portals and other dimensions. I don't tend toward this type of paranormal/fantasy device as a rule, but man, did I like it. The ability that Mia has (sounds with colors and such) is so cool and very grounded in reality so I didn't ever think 'this would never happen.' Maybe there are portals and I, without that ability, can't sense them.Bummer.Mia is pretty cool as are her friends; Austin and Em. I think my fave character was Arizona. Anyone who smiles and laughs and jokes that much is someone I could hang out with. Regulus does have the great eyes though. But Arizona would be my choice. :) Mia can have Regulus. LOL.I wished for a bit more character depth. The book read really fast and in some ways I really wanted it to slow down for emotional moments and character thoughts. That's probably just me and my love for characters over pacing, but I felt like I didn't get to enjoy hanging with these characters as much as I would have liked.I also really want to visit Whispering Woods now and hike with Biscuit (great dog and great dog name, Brinda!). I also really want to know how Mia's science project turns out. Which is a random thought, but I found it kinda cool.So, yes, I'll be adding the sequel to my kindle in the near future. Mia's older brother has been missing for two years, and she'd do anything to find him. She's certain he didn't just run away, but when she meets two interdimensional agents and learns her brother was supposed to work with them, she wonders what the truth of situation might be. The agents recruit Mia to take her brother's place as a portal locator, but is it safe to work with them? It's difficult to think when one of the enforcers is amazingly gorgeous, and she's so close to finding her brother. But illegal immigrants coming through the nearby portals might have other plans for her.A fantastic start to a YA paranormal series about parallel dimensions. I love the idea of beings from other worlds sneaking into ours through various portals around the planet and an agency trying to regulate them. Great world building with still a lot more to learn. I like Mia's determination, and the chemistry between her and Regulus. I could do without the jumping back and forth between first person and third person points of view, though.I definitely want to find out what happens in this series. I highly recommend this to YA paranormal fans. I highly recommend this book. It was very good. Brinda Berry sent the first three books in the Whispering Woods Series to me to review. Let me tell you. This. Book. Was. In-cred-ib-le. The main character, Mia, is fun to watch. As she discovers herself and surveys the world around her -I was unable to look away. Regulus was phenomenal. Uh, I'll take one please. I loved all of his interactions with Mia and his partner in crime, Arizona. Regulus was one of those characters I would love to see be made into a film just to challenge the casting director. Good luck finding someone that hot. This cover doesn't really scream Young Adult but don't let that fool you. I was hesitant at first too, but once getting into the series I realized that you shouldn't judge this book by it's cover. While the face of this book reads sensual adult novel the pages within are actually very innocent. There isn't a lot of cursing and minor kissing. There are some relationships that poke out at you at random times, (get a life Austin) but over all this book series is one I will surely continue on with. What's a feisty, 17 year-old girl supposed to do when two strangers turn up in her backyard and she finds out that she's one of the few people who can save mankind? She might hesitate a moment, especially when the two are from a different dimension and not entirely human (but not far off). But when they tell her that they may be able to help her discover if her beloved brother, who's been missing for some years, is still alive, then she's their girl.I'm not usually a YA reader but having heard of the large following that Brinda Berry is gaining and her reputation for fine writing, I jumped in. The Waiting Booth does not disappoint. Mia, the main character, has a terrific voice just right for the courageous "take no prisoners" girl and I was spurring her on all the way through the perfectly paced plot that is fun and nail-bitingly suspenseful. Courage, loyalty, the blooming of young love and rites of passage are interweaved in an ingenious tale. The Waiting Booth is the first in what I'm sure will prove to be a successful series. The Waiting Booth was enjoyable in every sense, very different from any book I have read. There is mystery, action, sweet romance and of course the gorgeous guys.Brinda Berry definitely captivated me with this paranormal twist involving synesthesia, a medical condition where senses overlap.Different and awesome, right? See what I mean? Mia and her missing brother Pete own these conditions and the IIA agency wants them. Her father is very protective for obvious reasons; mother left and now a missing son. Her great friends keep her balanced as she continues to search for her brother.I loved the characters especially Regulus he was all that and then some! But thoroughout the book you wonder if maybe there is something up his sleeves. Can Mia truly trust Regulus and Arizona?The end was crazy...I want to tell you but I won't ruin it with a spoiler link. Looking forward to the next book.FUN and ROMANTIC READ! The Waiting Booth is a great start to a new YA paranormal series. It has an interesting plot that hasn't been overdone in the genre before, which gives it a fresh voice. The characters are all intriguing, especially the main heroine Mia and her mysterious visitors Regulus and Arizona. A really cool aspect of this story deals with synesthesia, a medical condition where senses overlap. This gives the book a real edge with realistic but uncommon situations. The narrative is good and the book flows well and is easy to read. Berry blends common teen problems with paranormal twists - which keeps the readers on their toes. The ending is pretty open, which leaves the reader wanting answers in the next installment. I did think that the characters could be developed a little more, but I'm hoping that the writing style and characters will mature in the next book.Disclosure: I received a free copy of this book in exchange for an honest review. This book is so cool! Chips, portals, best friends, a little of family issue and ofcourse, romance! All in one!As I read this book, I can't wait to see what's going to happen on the next few pages. I am so tempted to take a look of this book's ending. Curiosity aside, as I read this book, the characters romance, attitudes and how they behave and interact with each other. .wow. I love it! I can really see how the characters relationship wih each other progress slowly.I love Arizona's humor and charm! He's a sweet man but I love Regulus more, tough on the outside, soft on the inside.To sum up everthing I thought about this book, all I can say is that I love this book! It's definitely a must read! I would like to give this book a little better review, but am torn by how I felt starting it off. It is very quick passed and the reader is given no time to meet the characters and digest the information. While there was no boring part in the book, there was something missing. I could not quiet put my finger one it. the story line was very original and kept flowing very smoothly. I did like the book though, it was not a bad read and am looking forward to the next one. I hope that her writing style will mature and that i will be able to add more stars to the next two. Also I need to add that the author gave me the book for free to do an honest review for her. I would like to thank her for that and say I really did enjoy reading it.